Glass Magic Professional Was There! 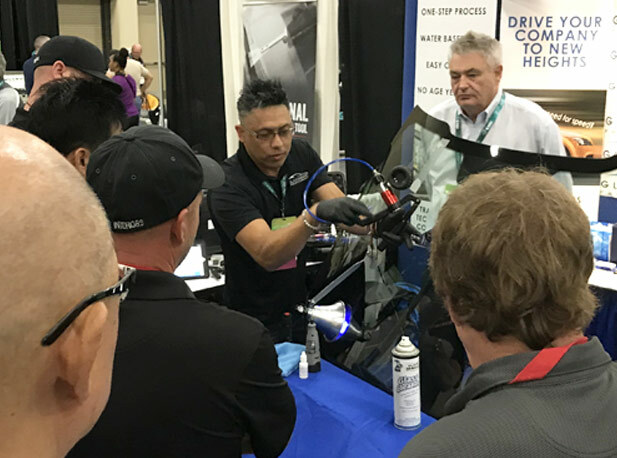 Glass Magic Professional was again proud to be a Cobalt Level Sponsor of Auto Glass Week 2018, held at the Henry B. Gonzalez Convention Center, in San Antonio, Texas. The big event was from September 27-29, and our team had an amazing time. We met many new people from all over the world, and we also got to visit with some great connections we made at last year's show. Hats off to our master guru technician, Ruben Lara (pictured above), who demonstrated our resin to crowds of attendees. Many people were fascinated not only with the 1-step process but also by how easily Glass Magic Professional penetrates due to its very low viscosity. 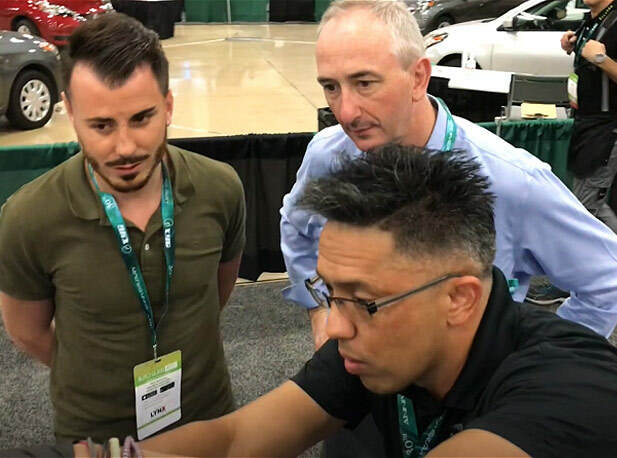 Above, Sylvain Pagezie (left), of Vitro Service France, and Mark Holmes of Panther Pro in the United Kingdom, watch as Ruben (foreground) demonstrates repair using our resin and newly updated repair kit. The new kit debuted at the show, and features everything techs need to execute the best repairs. 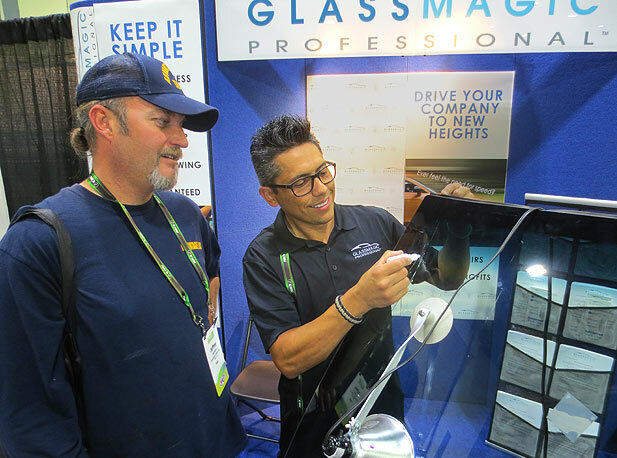 Glass Magic Professional couldn't have been happier with the show, and we look forward to a great year ahead until the show in 2019! We were proud to be a Cobalt Level Sponsor of Auto Glass Week 2017, held at the Palm Beach Convention Center, in Palm Beach Florida, the week of October 4th. We met people from all over the world, and our tradeshow reps had a great time connecting with so many great people. Many of the people we spoke with were not aware that Glass Magic Professional was a 1-step resin. Ruben Lara (above right) of our team demonstrates the process to Jeff Jackson (above left), of Advantage Glass in Cortez, Colorado. The demo emphasizes the fact that Glass Magic Professional's viscosity is excellent, allowing it to penetrate better and faster, and that it fills, seals and surfaces all in one step. Others were very intrigued by our Kit, which includes an easy-to-use yet high power hand pump, and our custom-designed bridge. 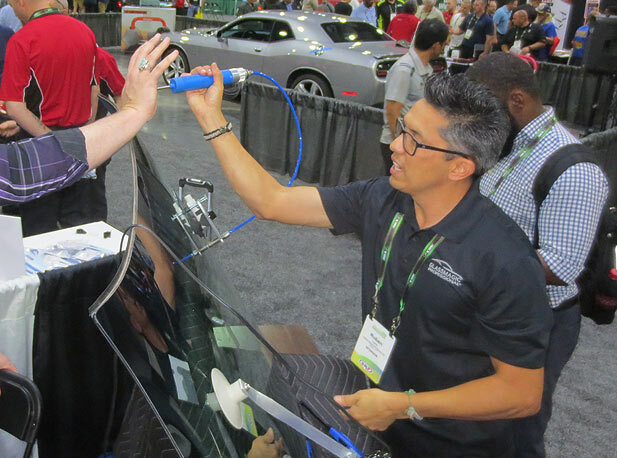 Auto Glass Week 2017 was a huge success, and watch for Glass Magic Professional at the 2018 show!